Nicholas Tse [谢霆锋] and Hilary Tsui [徐濠縈] were pictured at the Valentino Fall Winter 2014 show in Paris on 4 March 2014 as part of Paris Fashion Week FW14. 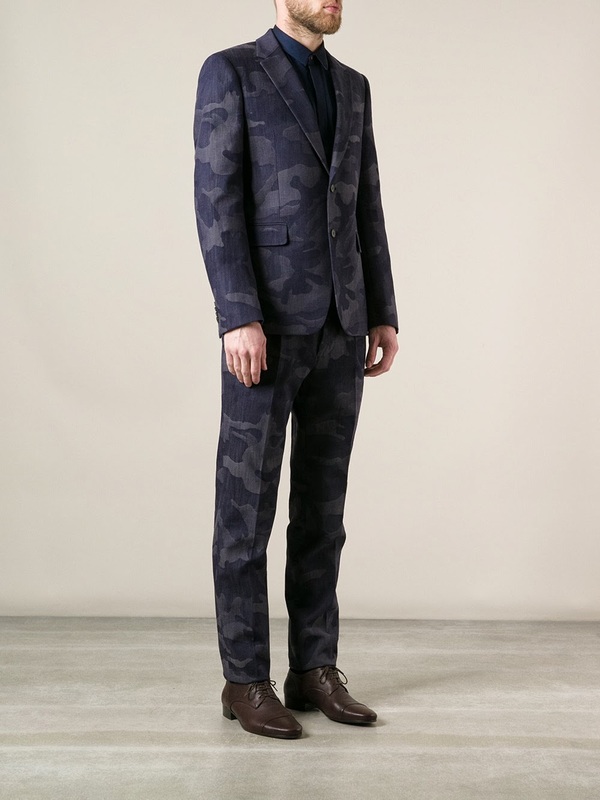 Nicholas Tse wore a blue / grey jacquard camouflage print suit from Valentino Spring Summer 2014, over a white shirt and navy knitwear. Tortoiseshell shades, gorgeous deep red brogues and slick side swept hair completed his look for the event. Having kept on and off with the celebrity news from the Far East for the last decade (gosh I am well old...), Nicholas Tse sure hasn't aged at all. Not to mention his hairstyle remained the same from many moons ago. I love the pairing of the red brogues with the camouflage suit to give it a nice fashionable contrast. The clever accessories plus the buttoned up white shirt nicely deflected the full on camouflage print. It is a difficult suit to wear, but I thought he did well. 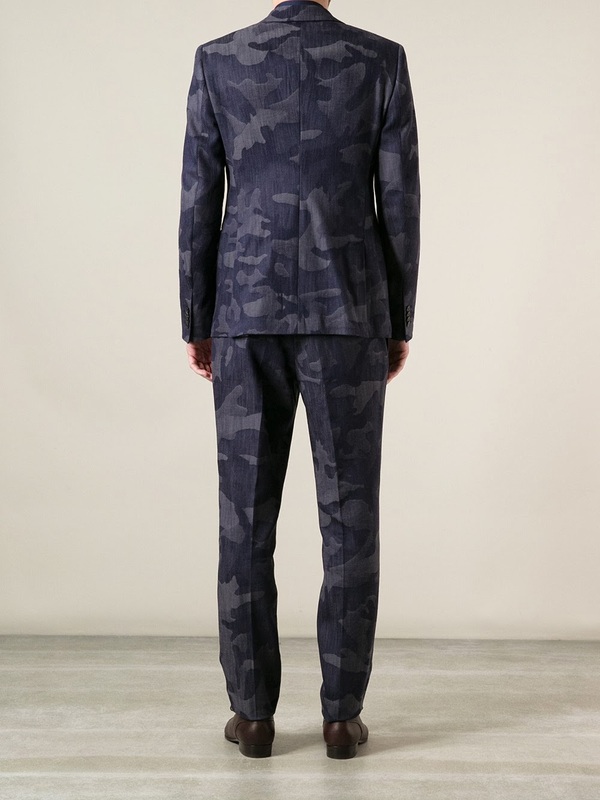 However, would you wear a full camouflage suit? Personally, I wouldn't. I spent two and a half years with the National Service when I was 18, and that was my uniform everyday. Not as chic and glamorous as the runway versions, but it served the intended purpose. I just cannot put myself through a full on camouflage look again unless war breaks out, which I hope not. It is also a little respect for the soldiers out there protecting the peace. Don't get me wrong, I love a little camouflage fashion accessory or clothing here and there. Maybe having been through the army myself, I don't find the whole camouflage look outside of the barracks to be any appealing. I cannot even go camping, or the thought of paying to go camping outdoors, pitching a tent etc. I've done that, got the t-shirt and moved on. That however is just my personal story, you guys keep saying I should talk more about me at times, so here I did. Don't let me stop you from buying the camouflage suit ok? Oh please do, it helps keep the site alive. 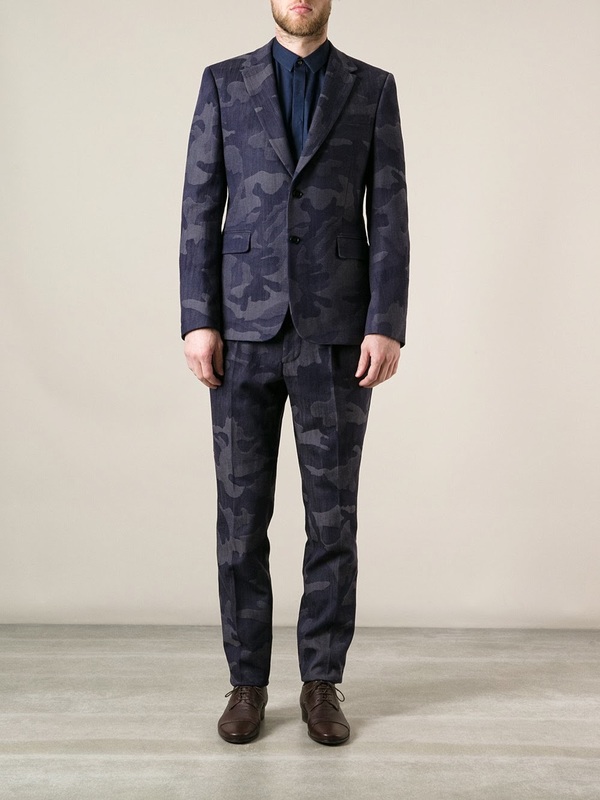 You can shop the Valentino jacquard camouflage print suit online from Farfetch.com. This sitting down picture does him no justice. When I first saw a pic of him (standing) posted by Valentino FB, I was blown away. Wasnt expecting him and being a non fan, I thought he looked great. i don't like him as he dated faye wong ha!